According to some, the DB5 may be the most famous car in the world. Instantly recognised after it's appearance in the 1963 James Bond movie 'Goldfinger' , the car used was in fact a Series V DB4 Vantage modified as the prototype DB5. The DB5 Vantage did not make it's first appearance until September 1964. 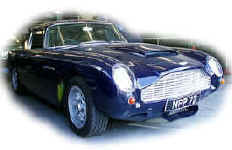 The prototype, DP 217, bore the chassis number DB5/1451/R and came fitted with triple Weber carbs and a 5 speed gearbox. In the Aston Martin brochure for the DB5 Vantage power is given as 325 BHP at 5750 RPM, some 40 HP more than the standard engine. Three twin choke Weber carburetors are fitted on flow tuned induction manifolds to give maximum ram effect. The head features extra large ports and modified valve timing. The distributor is also advanced for extra power and a flatter torque curve. The addition of a vacuum reservoir ensures continued operation of the power assisted brakes. DB5/1763/L was the first production car; externally distinguished only by Vantage badges on the engine side vents. In total 57 saloons were built, 7 convertibles (the name Volante was introduced later) and one estate. 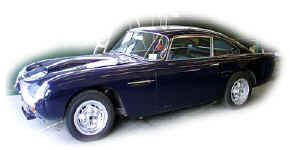 Two special DB5 Vantages were fitted with 4 liter twin plug GT specification engines. One a saloon DB5/1467/L and one a convertible DB5C/1515/R with an automatic gearbox. A single DB5 V8 was built. The first Vantage engined Volantes used the last of the DB5 chassis' and can be distinguished by a revised oil cooler opening, split front and rear bumpers (based on the DB6), a restyled rear light cluster and a Volante badge on the boot lid. Three were built in total. One of the rarest and most unusual of DB5's is, in fact, not a DB5 at all. It originated in June 1965 as a mobile test bed to take the V8 engine. 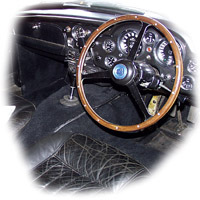 In mid 1966 it was fitted with the de Dion rear suspension. 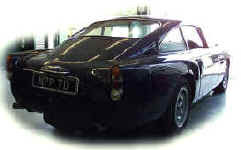 It was based on a DB5 chassis with a DB5 body. The original engine, 480/001/P, was derived from the racing Lola Aston Martin V8 unit..
Spoked wheels have been replaced by early V8 alloys and V8 brakes fitted. In the late 70's a V540 unit tuned for an aborted Le Mans car was fitted producing well over 400 bhp. The original engine was sold on with a Lola Aston Martin race car to the USA. The car is about to undergo restoration with possible fitment of a RSW 7 liter V8.